Marvel is vaguely on our radar because it produces 90 percent of movies, many of which I have watched and enjoyed! Now it is more on our radar because we exist inside its universe. The above panel appeared in Wednesday’s “Captain America: Steve Rogers #1" and was brought to our attention by our friends at io9. 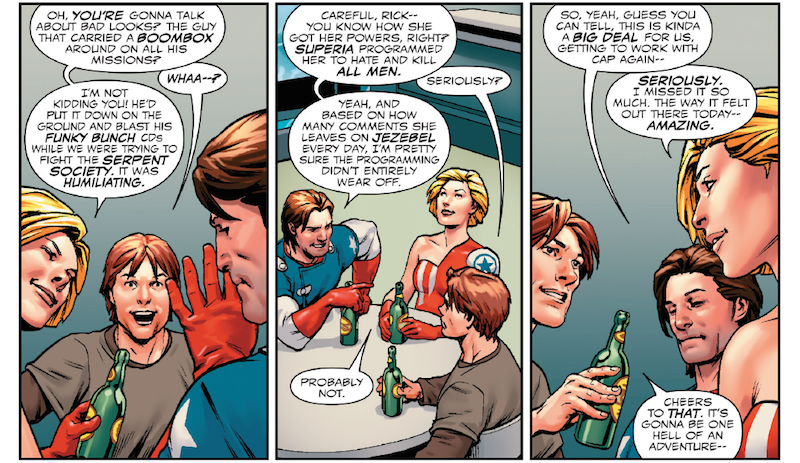 Basically, it’s two old allies of Captain America (Steve Rogers)—Jack Flag and Free Spirit—talking about their past team-ups with Steve and trying to embarrass each other. Jack Flag used to run around with a boom box that shot laser beams as his weapon (comic books!) and Free Spirit, who was created in the mid-90s, started out as a young woman named Cathy Webster who was given superhuman powers and subliminally brainwashed to HATE ALL MEN by a villainous scientist named Superia. Jack eventually stopped using the goofy boom box gun, and Cathy broke free of the brainwashing, and both have appeared intermittently alongside Captain America in his adventures since. This issue is their first appearance in Marvel’s “All-New, All-Different” comics reboot, and establishes them as members of Steve Rogers’ new team taking the fight to the evil organization Hydra. Anyway, thanks to Superia for programming us to hate and kill all men (except for Bobby), and thanks to Marvel for writing about it.